Sometimes you need a big home to accommodate your big lifestyle. You could have a growing family of kids you want to raise in Denver, a group of roommates who want to share a place without sacrificing too much privacy or individuality, or simply a desire to fill out your comfort zone with things you need for work or play. Our luxury Townhouse apartments in Denver at Alexan Arapahoe Square have the large spaces you need, along with incredible amenities you didn’t even realize you wanted. 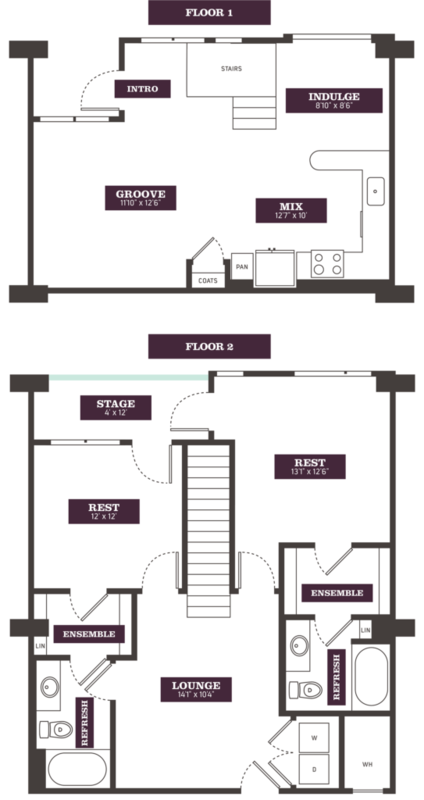 Our two-bedroom townhouse luxury apartments, the TH1, offer two floors, 1,322 square feet of living space, and an endless supply of relaxation for every tenant. The first floor brings a welcoming living atmosphere: share your favorite recipes and snacks in the open kitchen, complete with plenty of pantry and cabinet space and a separate dining room; store thick winter coats for you and your guests in the handy coat closet; and lounge back and enjoy all your favorite activities in the giant living room. The second floor, on the other hand, gives a restful paradise. Get some much-needed sleep in the two bedrooms, each with their own spa inspired bathroom and expansive walk-in closets. Step outside and take in fresh air and lovely Denver views from the private balcony. Finally, turn the upstairs lounge into your own personal realm, such as a home office or a second recreation room for hosting fun game nights. Go big and go home here at Alexan Arapahoe Square. Contact us today for more information on our upcoming luxury Townhouse apartments in Denver, including the TH1 floor plan.